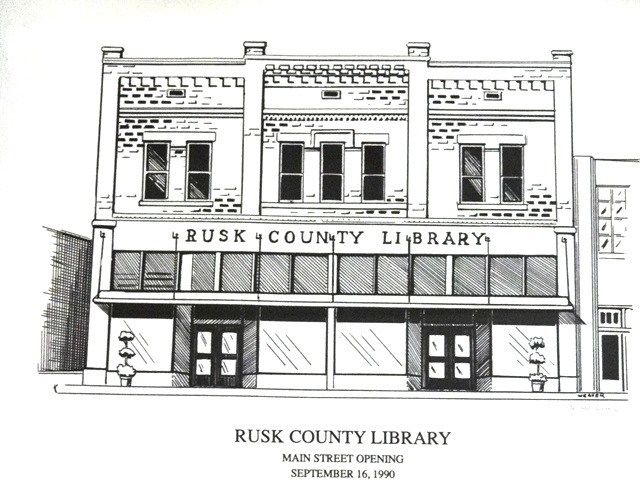 The Rusk County Library in Henderson opened on September 15, 1937 in one room in the basement of the Rusk County Courthouse. The Library was sponsored by the Pallas Athene Literary Society which had made library service a goal of the group since it's beginning in 1929. The opening was reported only on the society page, but there were new shelves, tables and 1827 books including fiction, non-fiction and reference for adults and children. Within the first two weeks 1749 volumes had been borrowed. In 1968, the library moved to a new 6,000 sq.ft. building built on land donated for the purpose a few blocks from downtown. By 1972 the Library was qualified for membership in the new Northeast Texas Library System. Growth accelerated in the early seventies so by the 1980's space was a major need. In 1990, the Library became part of Henderson's Main Street Project when the move was made to four combined store buildings, the oldest of which dated from 1872, on the southeast corner of the square in downtown Henderson. The restored building provided 18,000 sq. ft in a three level, two story facility. In November of 1990, The Texas Downtown Association awarded the "Library Best Public/Private Venture" and the downtown historic area is now listed on the National Register of Historic Places. By 1995 the goal was automation. Progress was made in stages, first being one internet computer for staff and public use, then circulation and the electronic catalog. Now the Library offers over 80,000 books in fiction, non-fiction and reference for children and adults plus very popular videotapes and audio books. Volunteers in Genealogy are available to help with family research in books or on CD sources or on microfilm. The Library continues to offer materials and services of interest to adults, children, and youth of Rusk County.